Land of Stone is a gripping, unusual book. I will hand-sell it until the cows come home! Karen Chase has invented a means of communication that is capable of stirring interest and communicative response even in a psychiatric patient who, for his own reasons, is determined not to be interested or responsive. The effectiveness of the quiet, elegant way, respectful of privacy, in which she invites interest and response makes the diagnostic interrogations and urgings to expression common in clinical work seem heavy-handed and primitive by comparison. In character, she does not presume to teach a lesson to clinicians, but there is one to be learned here nevertheless. Land of Stone is hard to put down. Its message lingers long after one regretfully returns it to the shelf: In a time when we are more isolated from one another than ever, language still has the capacity to make us less alone." The teacher is a poet who understands the depths of helplessness from battles with childhood polio. Her student is a young man sealed in a cocoon of silence by a series of traumas. In a psychiatric ward, they wrote poetry together, poet and patient, alternating with each other, one line at a time. This simple story is told with such honesty and force, chances are you will not put the book down until the last poem. Land of Stone is also a story of the many intimate roles that language plays in our lives, in the sounds and images it evokes. 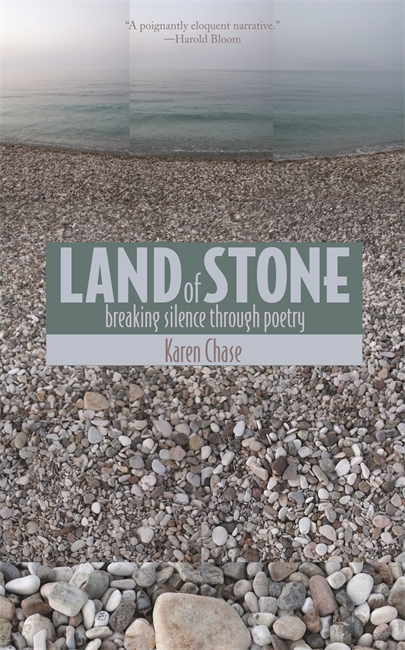 Karen Chase's Land of Stone is a poignantly eloquent narrative of the therapeutic relationship between an admirably humane, gifted poet and a schizophrenic young man. No miracle takes place, nor need ensue, but both are changed somewhat for the better. Chase is restrained and persuasive in telling her story.